This is a special series of lost classic programs from the Golden Age of TV, all of which have been restored from the best archival film elements available in high definition. 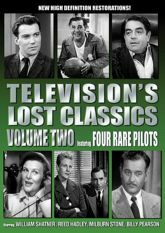 Volume Two contains four rare 'Pilot' episodes. The first pilot, titled "Case of the Sure Thing," introduced the series Racket Squad, which lasted for 3 seasons and was nominated for 2 Primetime Emmys. It was first broadcast on CBS on Thursday, June 7, 1951, and starred Reed Hadley as Captain Braddock, and was written by Arthur Orloff. The second pilot, titled "Cool and Lam," is a light-hearted, detective yarn featuring characters first created by Erle Stanley Gardner. Bertha Cool runs a detective agency and Donald Lam is her junior partner. Directed by Jacques Tourneur. The third pilot is a really rare treat: "The Life of Riley," starring Lon Chaney, Jr. as Chester Riley! This stand-alone episode was produced in 1948, but by the time the first season went into full production in 1949, Chaney had been replaced by Jackie Gleason! The fourth pilot, "Nero Wolfe," is based on characters created by Rex Stout. This is another one-off production. Kurt Kasznar is seen as Nero Wolfe, with future mega-star William Shatner co-starring. The story deals with the mysterious death of a rocket scientist. Included on the disc is a bonus CBS Blooper Reel for the long-running "Gunsmoke" series, hosted by James Arness.